I saw Shanna post this amazing blazer and short suit a few weeks ago and saw it in my size when Aaron and I stopped at the outlets on the way back from the beach last weekend. I tried to justify buying it because its pretty much the coolest but it just felt too impractical. (So I got these shoes instead.....) I couldn't stop thinking about it and two days later it went on sale again. Again, I tried to justify its practicality and that it was a closet staple until a friend told me "don't try to pretend its a closet staple; its cool and you want it." SOLD. I bought these sunglasses on Ideeli last week and didn't realize they were rubberized. They look terrible on me and are non-returnable. Anybody have any advice or luck selling on ebay? I'm turning 28 in a month (cue meltdown) and this could not be more true. Orange is the New Black returns today. I promised Aaron I wouldn't watch it while he was backpacking this weekend but I'm really regretting that promise.... Have you seen this trailer? Julia's blog Lemon Stripes has been a favorite of mine for awhile but I have yet to try any of her recipes. I stopped eating meat about a month ago and have been in need of new creative recipies and I can't wait to try her vegan kale caesar this weekend. Two minute hair styles. Enough said. 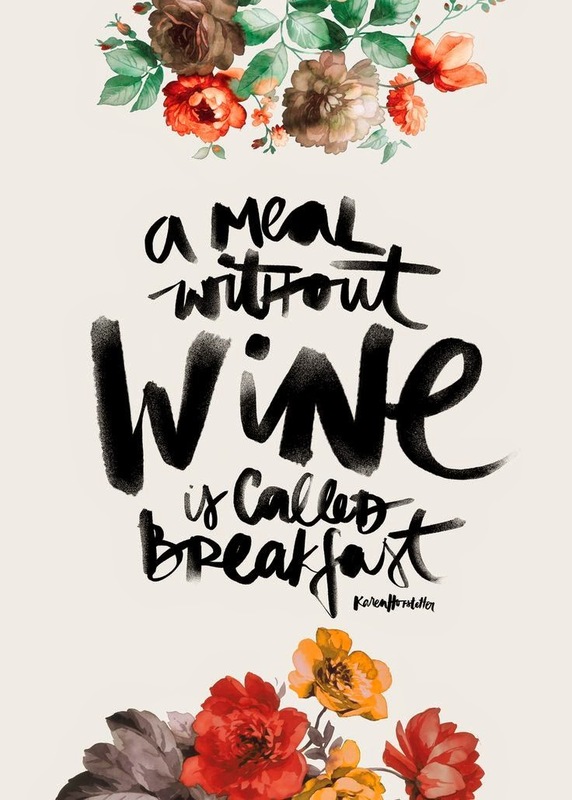 A meal without wine is called breakfast...YES. And oh my goodness, that trailer is golden! Haha! Hope you figure something out with the sunglasses!